in my most recent update, I had mentioned that I went out and picked up a drawing tablet for my desktop PC. I was only able to give it about a paragraph, and I had some other things to say about it (or at least expand on what I'd said before), so here goes. Sorry, but some info will have to be restated. Specifically, I got a Wacom Intuos Pen Small Tablet, a name that I just know could be shorter. They come in multiple flavors, mine being the entry-level one listed at $79.99, but you can find them a little cheaper online. I'd used the Paint Park Plus app on my Playstation Vita, and also messed around with my boyfriend-in-law's Nexus, which had AutoDesk Sketchbook on it. I was quickly hooked on the idea of digital art, and decided I wanted something to draw with. 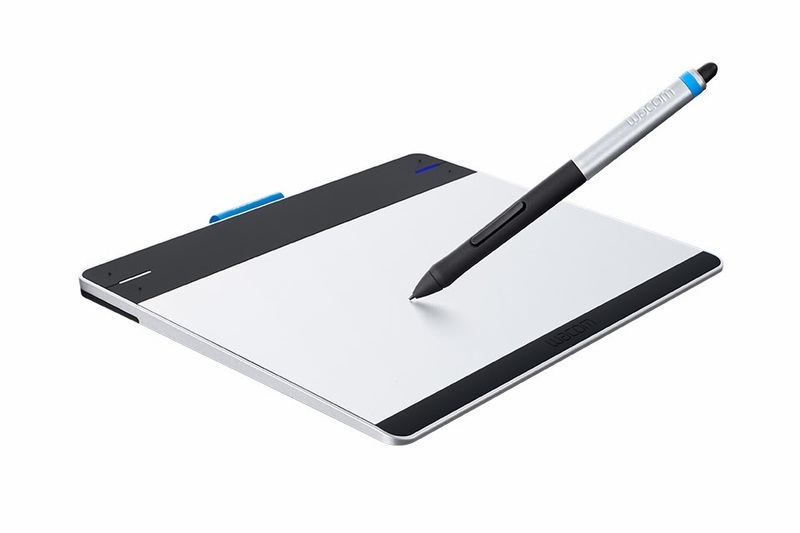 After some lazy research, I decided on this Wacom tablet; it's essentially the cheapest possible drawing tablet you can get, which was exactly what I was willing to invest in order to dip my feet. There's one cheaper than this, which is the Bamboo Pad USB (also by Wacom) at $49, but you can only buy it from Wacom online. I wanted mine nao, and also wanted a larger active area, so I went with the Intuos. The other ways I'd tried painting (traditional and digital) allowed you to draw directly on your image, so I wasn't sure how that was supposed to be handled when the image and your input are separated. I'm a tad surprised to say it actually handles it exceptionally well. I overthink things, so leading up to getting it, I'd invented a lot of potential issues and annoyances for it to have. Every single one of them turned out to be unfounded, and each issue had a workaround built in. Most significantly, you don't have to be touching the pad to manipulate the pointer. The tablet knows when (and where) your stylus is hovering above its surface, with about an inch of air before it loses signal. The stylus itself has no power source, so I'm a little stumped by how it does that. When the stylus registers on the tablet, it takes over for your mouse so that you can move it around, and then tapping (or pressing) stands in for the click. The pen also has 2 functional buttons. I'd commented on how it feels a little cheap, but I've found that was unfair. I noticed that issue most significantly when I took it out of the package for the first time, and examined it with all the scrutiny one does after they've dropped cash on something they're not sure about. But the thing is, I never hold it. With the 3-4 foot USB cable, it's always planted on my desk, and doesn't move. While writing this I'm holding it again to verify, and ... I guess it doesn't feel that cheap. It feels appropriate, even. Maybe I was just expecting it to feel a little more solid, as I was comparing it to mobile tablets, which have more components, are heavier, and consequently are more sturdily built. My bad. It's surface is semitextured, not unlike what you'd find on most laptop trackpads. Not much to say otherwise, it just felt noteworthy. You can't use it as a touchpad, just FYI. The stylus input is surprisingly sensitive in a good way, and accurate. There is definitely a learning curve in using it, though. Expect to take a few hours of combined usage in order to get the feel of hovering, tapping, and making strokes. My initial test was so awkward that I started to get buyer's remorse, but after using it found that I really enjoy the way it feels. It handles drawing to my satisfaction which, again, I mean in a good way. It's exactly what I was hoping for, with no jitter or any mechanical issues or limitations. Even if I kept at it and got significantly better, I couldn't really ever imagine needing to upgrade. The version I got comes with AutoDesk Sketchbook Express, which I think is available to Windows 8 users free (through the store). I guess it's nice if you have Windows 7. I used it to draw that picture of Gohan I posted earlier, and am currently working on Rin from Katawa Shoujo. While I'm guessing it's no Photoshop, I actually like it's simplicity for now. Bear in mind I'm just starting out, and at the time of writing it's all I really need. It's got your basic airbrush, pencil, paintbrush, fill, and so on, and it also supports layers. The tablet also came with ArtRage3 Studio, which I haven't used so I can't really review it. The more expensive models come with other software, including Photoshop Elements. I'll embed a video of Sketchbook Pro (This is the upgraded version of Express; it just has more brush tools) so you can see, if you're interested. The one below is a little different aesthetically, but seems to be identical functionally. Mine also doesn't have wireless; it uses a USB cable for input only, and the device end of it is uniquely shaped. Your local Target or Best Buy won't have a replacement one that fits, and Wacom doesn't make a longer one. If you want longer reach, it's the $40 Wacom wireless add-on for you. You can step around this little problem by getting one of the more-expensive tablets from the get-go. I think mine is the only one that doesn't come with it. Wish I'da thought of that. Tiny gripes like that aside, I really love this tablet. I've only drawn one complete image so far, and am working on my second, and I can say I'm looking forward to using it a ton more. If you're looking for a place to start with digital art input, this will help you do that, and a lot more.